If you find that you are having to work with multiple folders at the same time, you no doubt find it annoying to have to have multiple Explorer windows open. Just as web browsers now all support tabs so that it is possible to view multiple web sites within the same browser window, so Clover enables you to add much the same feature to Explorer – this is an add-on for Windows Explorer rather than a replacement. There are a number of Explorer replacement tools that can be used to gain access to extra features such as a tabbed interface, but these have one fairly major down side. Most people access Windows Explorer using the Windows key and E keyboard shortcut, and as this is a reserved shortcut, it is not possible to assign it to other program – thus Explorer-replacement tools have to be launched using a different key combo. This is not the case with Clover. Rather than being a replacement for Explorer, it is actually and add-on. This means that when you launch Explorer – be it by using a Start menu shortcut, a Quick Launch icon or the keyboard shortcut – you still gain access to these extra options. The big news in Clover is the existence of tabs, and these work precisely as you would expect. 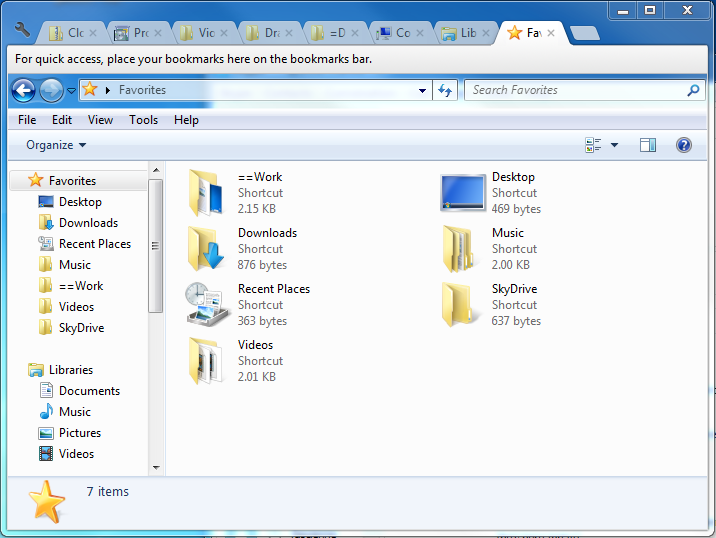 Any folder you would normally have open in a separate Explorer window is now housed in its own tab. You can navigate between them in just the same way as in your web browser. The same keyboard shortcuts work with Clover – so you can press Ctrl and T to open a new tab – and there are also extra features such as the ability to create a toolbar filled with links to your most frequently used locations. - Fixed: Clover crash on Win10. - Fixed：Bug about logging in. One of the best enhancements you will find for Explorer. It is simple, elegant and immensely useful. The installer is still not in English. What bothers me is there are two options that I can not read and understand. I am reluctant to blindly install anything without knowing the consequences. If anyone can translate these options I would be grateful. The installer is Korean. I had to accept the default settings with no idea what they meant. Found it added too much to the registry for my taste. I like the way it uses basic explorer and adds to it. I know hence called an add-on. :) The feature I miss the most is session handling like other explorer replacements do. I use CubicExplorer but have for now switched to this one. Thanks to the author.